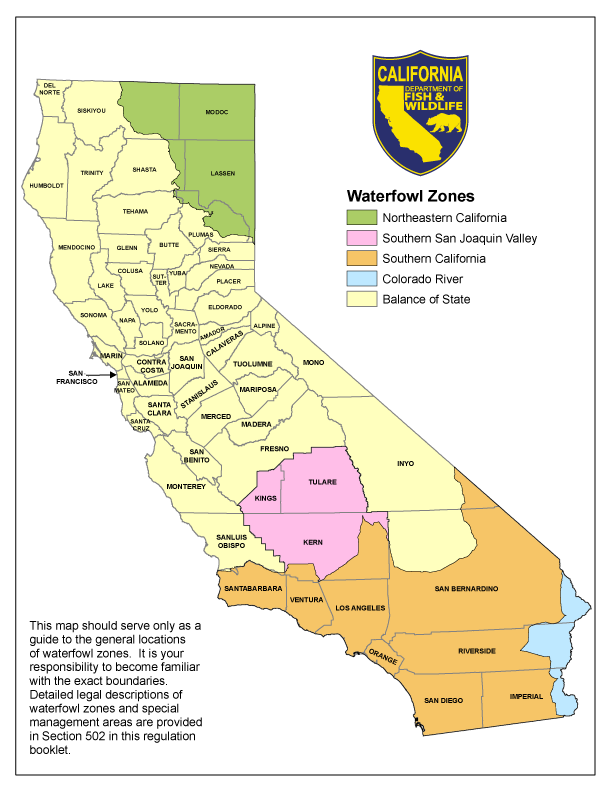 As California’s 2016-2017 waterfowl hunting season approaches, the California Department of Fish and Wildlife (CDFW) advises hunters to stay informed about the status of wildlife areas. Limited opportunities or closures in the areas where they plan to hunt are likely to occur again this year given limited water supplies in some regions of the state early in the season. It is also common for waterfowl hunting areas to close periodically throughout the season due to safety concerns caused by flooding. Areas that most commonly experience flood closures include Sutter National Wildlife Refuge, Yolo Bypass Wildlife Area, Delevan National Wildlife Refuge, Little Dry Creek and Howard Slough. Waterfowl hunters should keep informed about current reservation and quota numbers, which are expected to fluctuate frequently. Reservations for state-operated wildlife areas that are closed due to flooding will not be accepted at other hunting areas, and refunds will not be issued for applications submitted to areas that are closed or if reservations are not available. Hunters can follow the Twitter tag #cawildlifeareaclosures for updates on state-operated wildlife area closures. Opening and closing dates vary by zone. These dates, along with detailed information about daily bag and possession limits, can be found in the 2016-2017 Waterfowl Regulations booklet. Quality public hunting access can be found on more than two dozen national wildlife refuges and wildlife areas and ecological reserves managed by CDFW. Please note that nonlead ammunition is now required when hunting on CDFW wildlife areas and ecological reserves. For more information please see the CDFW nonlead ammunition webpage. A valid California hunting license, appropriate validations and a signed federal waterfowl conservation stamp must be obtained before entering the field. In addition, a wildlife area pass is required to hunt on many state-operated wildlife areas. Licenses, validations and passes are not sold at wildlife areas, so hunters must purchase these items in advance. California hunters are required to complete a hunter education training course before purchasing a hunting license for the first time in California. Approximately 30,000 students complete this requirement annually.